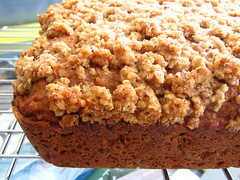 Applesauce Snack Cake with Oat-Nut Streusel - Do You Know The Muffin Man? Notes: Dan-D Foods (makers of Dan-D-Pack stuff) has unsulphured dried apples which I used for this cake, along with some Ontario apple cider and leftover unsweetened applesauce. The prep for this cake is time-consuming, as well as using a lot of bowls. In a nod to healthiness, I added a few tablespoons of wheat germ to the batter. I like my streusel very fine, so I blitzed the oatmeal and nuts in the food processor. The cake was done after about 50 minutes. I was expecting an overwhelming apple flavour but that wasn't the case. Everyone enjoyed this very moist cake, not too sweet or heavy.